Shared care can been seen by many as an unachievable goal, particularly after a messy divorce. But in some cases, if both parents are able to put aside their differences and work together, shared care can work. One of the tools used by experts is the Parental Alliance Measure. This assesses the parenting aspects of a couple’s relationship and examines each parent’s perception of the strength of their parenting alliance—how cooperative, communicative, and mutually respectful they are with regard to caring for their children. Often, it is the lack of mutual respect either one or both parents have for the other, which is their downfall. This is particularly so where there has been a history of family violence or controlling behaviour by one parent over the other. 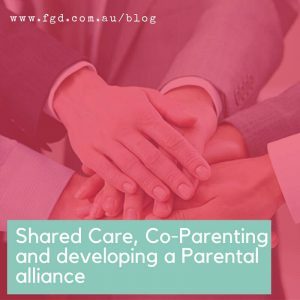 If the parents try to impose a shared care arrangement on the children where this Parental Alliance is lacking, it can be difficult for all involved, particularly the children. Breakup Recovery Coach Joanne Michelle says “An important thing to remember when you are in a co-parenting relationship is to remind yourself even though you are both no longer Partners, you are still Parents to your children. Keep any differences separate when it comes to caring for your children, and always make decisions based in the best interests of your children”. So what can you do to make a shared care arrangement more likely to work and be beneficial for all? It is important to come up with a plan for how things will work for the children, both in the short term and the long term. You might be able to get along now, but sometimes things change, so it is good to have a backup plan that will apply if you later cannot agree. A plan also means that as the parents, you tell the children what is going to happen. It gives them some certainty in what can be a very uncertain time and avoids putting them in the middle. Once you have the default plan in place, you may from time to time need to vary from it. And that is ok. You might feel annoying that you miss out on you scheduled time so the other parent can take the children to a special event, but remember, you are also likely to want to be able to take the children to something special outside of the plan in the future, and flexibility goes both ways. Sometimes things go wrong – people run late, forget to do something or do things you don’t like. Don’t rush to assume that something the other parent does is a deliberate choice by them to do something to upset you. It might be that they are just a parent having a bad day. No matter how upset you are, lashing out at the other parent is not going to bring about a positive result for anyone. Likewise, saying bad things about the other parent in front of the children only serves to hurt your children. Be the bigger person. No parent is perfect. Separation is a stressful time for everyone and every parent can take positive steps to learn more about how separation impacts your children and what you can do to help them. There are many great services out there. Organisations such as Marymead, and Relationships Australia, for example, offer great parenting courses as well as support groups for parents (and children) who need assistance. Having a ‘shared care’ arrangement is not about ensuring you have mathematically calculated the exact number of hours/days/nights that each parent has with the children. It is not about what is fair, it is about what works best for the children. Focus on quality time with the children, not quantity – this is what your children will remember. Going to Court is likely to break down any Parental Alliance you may have been able to develop. There are many alternatives to Court including Collaborative Law, Mediation, Facilitation, Negotiation and Arbitration. Staying out of Court and using one of these alternative dispute resolution methods is much more likely to be conducive to shared care. Not all Family Lawyers encourage you to go to Court – in fact – that is the last place I want you to go (particularly if you want shared care!) But that doesn’t mean avoiding legal advice. Legal advice that is particular to your circumstances is just one piece of the puzzle in developing a plan that will stand the test of time. Before you jump in the deep end, get some advice from a lawyer who specialises in family law. Contact me or one of my colleagues at Farrar Gesini Dunn for advice about your options.